“Inuit Nunangat” is the Inuktitut expression for “Inuit homeland.” The Inuit Nunangat consists of four regions that extend across northern Canada. Inuit have inhabited this region for 5,000 years. 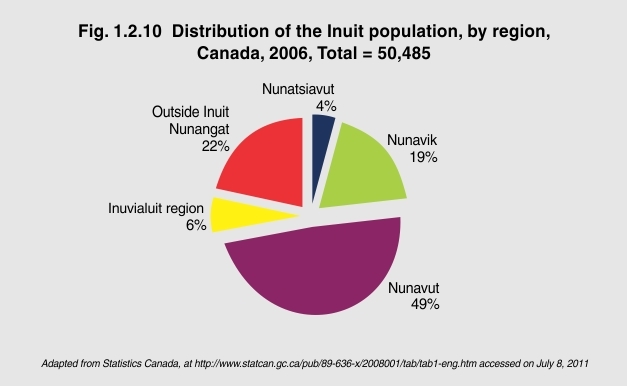 In 2006, the majority of Inuit (78%) lived in Inuit Nunangat. Of the total Inuit population in Canada, 49% lived in Nunavut, 19% in Nunavik in northern Quebec, 6% in the Inuvialuit region of the Northwest Territories and 4% in Nunatsiavut in northern Labrador.